WebDAV is a distributed web authoring implementation built into HTTP that allows you to easily share files and work collaboratively with others. We can install this extension within a web server to allow remote read and write access to local files through a web browser. In this guide, we will be configuring WebDAV on an Ubuntu 12.04 VPS with the Apache web server. Our implementation of WebDAV will be established on Apache through the use of the WebDAV module. First, you will need to install Apache from Ubuntu's default repositories. You now have a fully functioning web server installed. It should be accessible already by navigating to your server's IP address in a web browser. Apache has built-in support for WebDAV with a few modules. We simply have to enable them to get access to their functions. WebDAV as a functionality is now enabled, but we still haven't configured it correctly yet for our server. We will create a directory that will house our WebDAV file content. 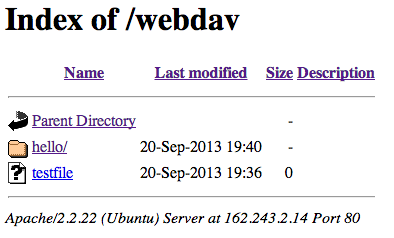 The default document root of the Apache server on Ubuntu is located at /var/www. However, we will be creating an alias, which will allow us to keep our directory content elsewhere. We can create an authentication procedure for accessing the directory content by creating an htpasswd file. Now, we will have to configure access to our content directory and tell Apache to use the WebDAV modules to serve that location. We will also have to note the authentication scheme we've created. Here, our web content is served out of /var/www like normal. We will add some information that will allow Apache to treat content in our new directory as WebDAV material. Below the directory listings, we will add an alias directive to tell Apache that requests for "/webdav" should be served out of the /webdav directory we created. We will then add options to allow authentication using the methods we established. You can test the results of you configuration first in a web browser, and then in a WebDAV client. To test that your authentication is working correctly, navigate to your server's IP address or domain name using a web browser. This demonstrates that the regular web functionality is working. We don't currently have any content here, but we'll be able to change that by accessing the same area with a WebDAV client. There are many WebDAV clients and support for WebDAV access is baked into many popular file managers. For simplicity's sake, we'll use an easy command-line WebDAV client called "cadaver" in this guide. You must type the "http://" portion for cadaver to find your server correctly. We will need to authenticate again, and then we'll be dropped into a command-line interface. From here, we can operate the client and host at the same time using commands that are similar to regular Linux commands. Listing collection `/webdav/': collection is empty. Although the directory listings are useful for seeing the files that WebDAV has available, it's often useful, especially if you are using this for actual web content, to turn that listing off. This page will now appear when we're navigating to the main WebDAV directory, but the edit functionality will still be enabled with clients. You should now have a WebDAV directory complete with basic authentication. If your directory contains content that absolutely must be kept secure, you might want to implement an SSL solution on top of the password authentication. This, however, is outside of the scope of this article. Many file managers and clients exist that can seamlessly access and modify WebDAV content as if it were additional local storage. WebDAV allows for a much more dynamic HTTP experience than is traditionally possible.